In the mood to be different or weird this Halloween? Here are ten weird Halloween costume ideas that will make you stand out in the crowd. ss up as one of their favorite teletubbies but others might think that you’re weird for dressing up as one. Teletubbies have been around for a long time but many kids still like them and if you’re going to an adult party afterwards and leaving the child home with a babysitter then this outfit still could be a hit at the party. Is the Christmas Tree Adult costume weird or cool? I guess it depends. Are you wanting to be funny this Halloween or confused about the holiday? This costume can be fun to do because you can include ornaments, stockings and well, dress up your costume as a Christmas tree. Do you feel like being Lord for one evening? Everyone knows who Caesar is and will know who you are right away if you dress up as him. Be sure that you complete your costume with a gold cape. Ladies, you can dress up as a Roman Goddess. 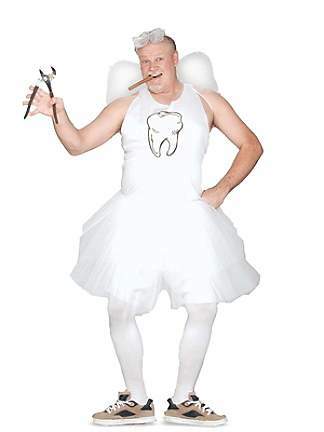 Sorry Ladies, this tooth fairy costume is one for the guy’s. Do you like the movie The Tooth Fairy with Dwayne Johnson in it? This is your time to dress up and look like him. Ladies, you could always dress up as a pretty fairy princess – you might not be weird, but you could look very pretty. This is a great one for him and her. She could be the mustard and the guy could be the ketchup or other way around. You decide together. If you have a child then maybe your child could be the hotdog. Everyone can join in on the fun of dressing up as a tacky tourist. Put on a shirt that is loud with Hawaiian print all over it, get out those Khaki pair of pants or shorts and maybe get shorts that have an inflatable hoop around them to look real tacky or stuff your shorts or pants with pillows. Does everyone call you a nerd or do you just feel nerdy? Now is the time to embrace the nerd in you and show it on Halloween night. Just wear black pants, pull them up to your armpits, wear a pocket protector and have on glasses that are horn rimmed and thick. Gal’s you can do the same and be nerds together. hippy. Maybe you still have that hippy vest or those hippy pants in your closet that you’ve been dying to use for the past several years. Go ahead and get it out and dress up as a hippy. Wear babby jammies and let your inner child come out this Halloween. Don’t forget to wear a baby bonnet and a bib with your costume. You’ll be able to throw as many tantrums as you want all night long. Dressing up as one of the Avengers might make you look cool or weird depending on how you dress. Dress up as Black Widow or Hulk but Loki might be waiting for you so be ready. You can never go wrong with Iron Man.